Anyone else feel like you blinked and now it’s Easter? I figured I better hurry and put out a few Easter decorations ASAP or I might miss the holiday entirely. Better late than never, right? So I went over to the Dollar Store yesterday and found a few little Easter decorations. 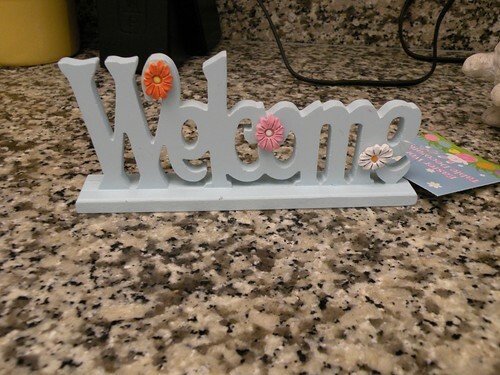 Before I primed any of them, I had to prep the Welcome sign because I’m just not feelin’ those flowers. They were so easy to pop off. 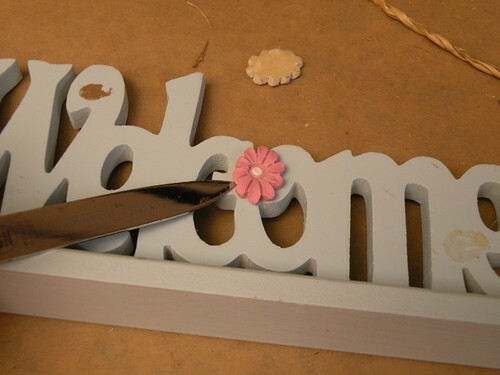 Then I just sanded a little bit where the flowers were glued on. Then I took all the little decorations outside and primed them. After they were all primed I simply gave each of them a nice even coat of flat white spray paint. Um, meh. I think overall this one is a miss. I guess I could have put some wood filler on those leftover flower holes. Well, for a buck it’ll be a great decoration for the next week and a half. 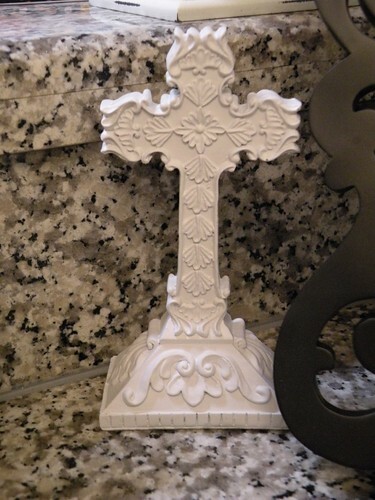 I really like the way the cross turned out. I love the detail on it. Maybe some day I’ll repaint it heirloom white for a more antique look. The bunnies are cute. I like them much better white. Now all I need is some moss and a few little eggs around them. Overall, for $4 total I think they turned out pretty cute. 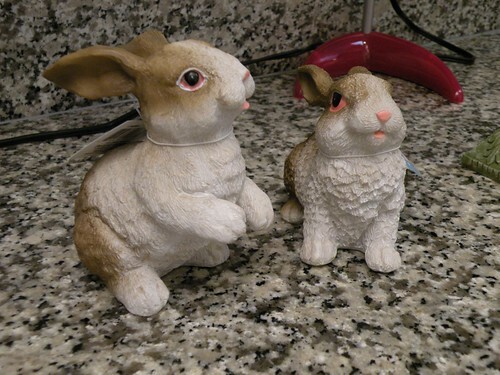 I have some really great Easter stuff back home and since we are driving back to Texas this summer I can’t acquire too much stuff or it wont all fit in our trailer, so these little decorations will have to do this year. Isn’t there some saying about “less is more sometimes”? Wow! It never ceases to amaze me what can be done with $1 and some spray paint! 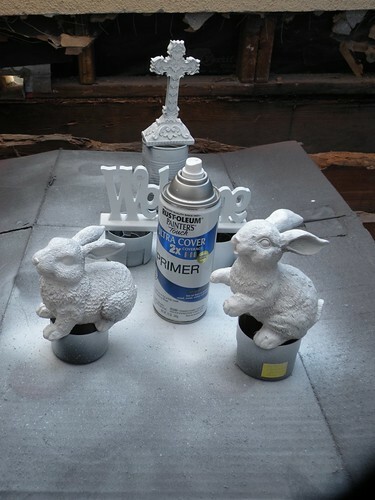 The bunnies look great spraypainted white! Thanks for your comment on my “working wardrobe” post. Ross is another one of my favs! ohhh I love the bunnies! all your transformation were great! Great call on the white spray paint! It took the bunnies from slightly scary to super cute! I love those bunnies in white!! Great job! 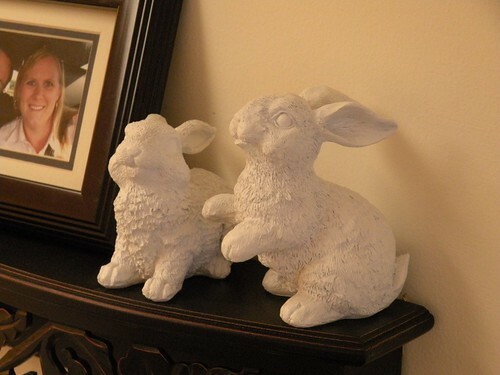 Those painted bunnies turned out so cute ~ what a great idea! Girl, you have vision! Those rabbits looked freaky. I would have walked right past them in the store. They look FANTASTIC with a coat of white spray paint. Great job. Wow. I am impressed! 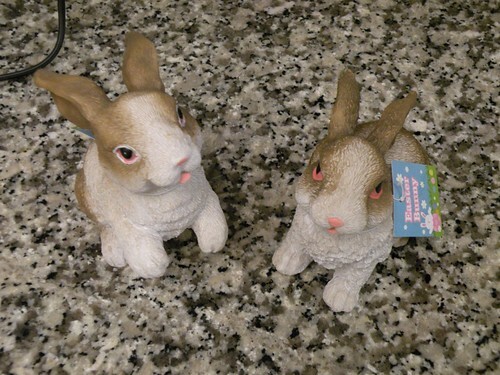 I could not find too much by the way of natural looking decor for Easter and bought nothing so far. I am raring to go get some bunnies and paint them white now though! 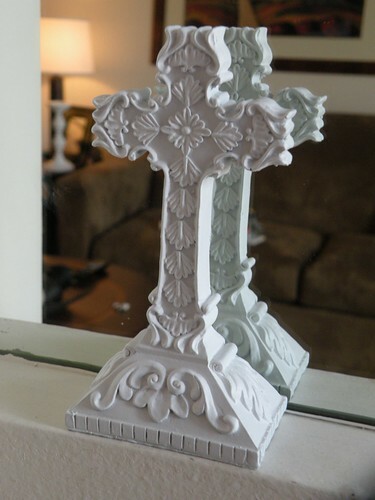 Love how some spray paint transforms these into beauties – the cross is my favorite, love that decal! 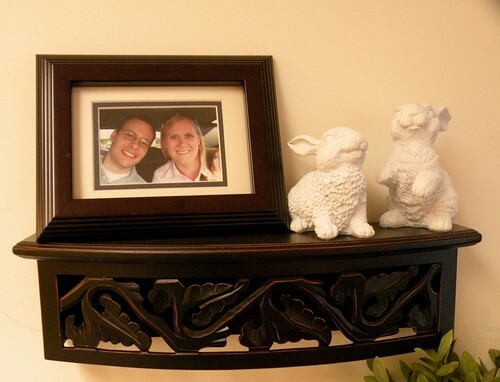 You’d LOVE my mom’s awesome-and-so-cheap-it’s-almost-free Easter garland idea. Love the little bunny, how cute! 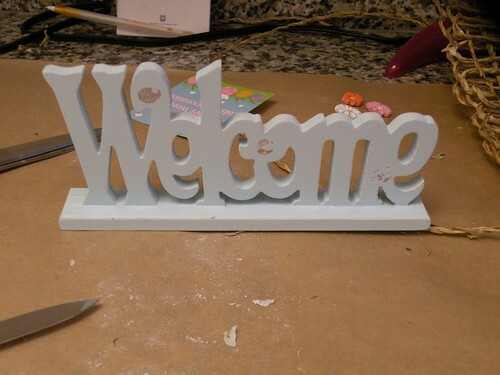 I would love for you to come by and link up your Spring related crafts to my Soring blog party. I love me some white spray paint! I love how everything turned out. The bunnies are MUCH cuter white. 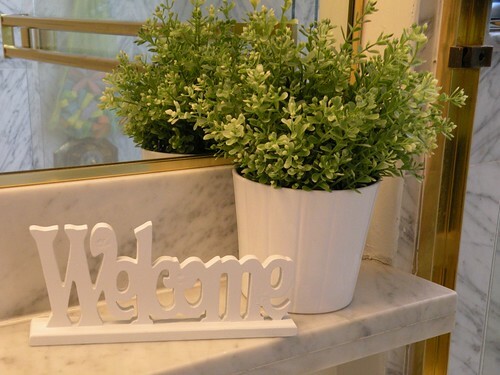 aw, your house is gonna look amazing. I love it! I love spray paint. You can change the look of things with paint. It looks good. It’s amazing what a little spray paint can do to make things fresh. I love the bunnies! 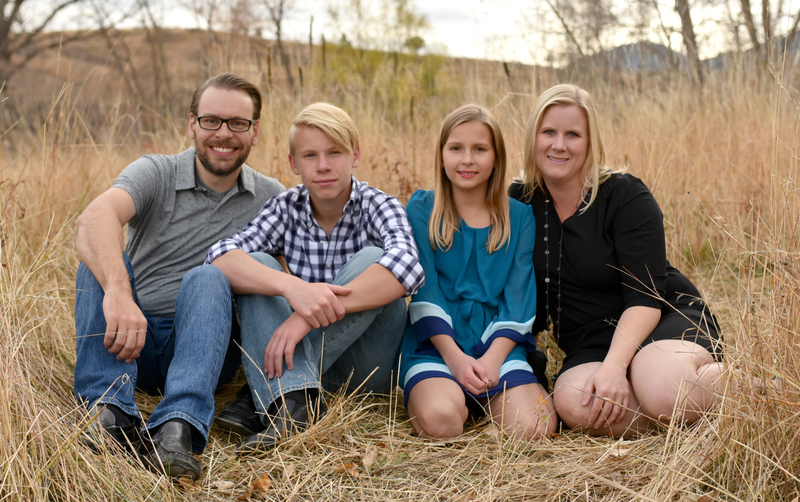 Thanks again for linking up to Make it Yours Day at My Backyard Eden! Very cute transformation! What a cheap, easy Easter decoration. I think Heirloom white will be perfect! Spray paint is magnificent! Thanks for linking up! Great deals! 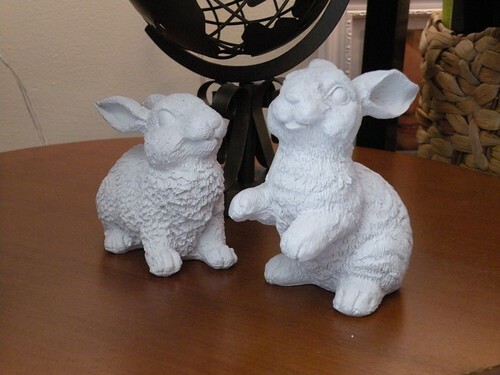 The little bunnies are adorable & everything looks great all creamy white. No, for pink bunny eyes. Yes, for spray paint! I love the bunnies. They look really nice painted white. The cross looks much better as well. I love the white, they look so clean and cute! It all looks great! I love the bunnies! They turned out cute! 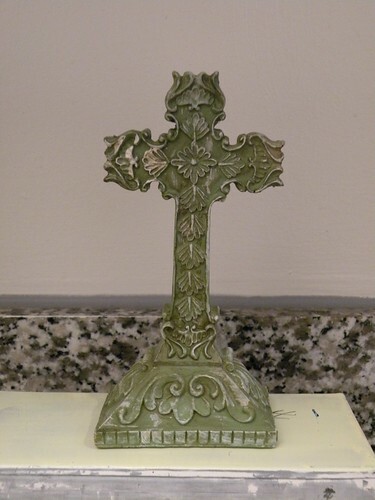 It’s amazing what a little spray paint can do for some DT items, isn’t it? Just hopping over from WFMW. Cute idea. I think I just might steel it. Looks far more expensive than $4. Great job! These turned out great. I love how much it made it all look so cute! Those bunnies were totally transformed!! Thanks for sharing at Fun to Craft’s Spring has Sprung Party. Dollar Store? Dollar General? Dollar Tree? Those bunnies are adorable!